The first genocide of the 20th century occurred not in Europe but in Southwest Africa, a colony that had been annexed by Germany in the early 1880s. Between August 1904 and 1907, the Germans attempted to exterminate the indigenous Ovaherero people, along with the groups of rebellious Khoikhoi. The Germans did not succeed in killing all of these insurgents, but their explicit intentional effort to do so qualifies their actions clearly as genocidal. does not necessarily mean the immediate destruction of a nation, except when accomplished by mass killings of all members of a nation. It is intended rather to signify a coordinated plan of different actions aiming at the destruction of essential foundations of the life of national groups, with the aim of annihilating the groups themselves. The objectives of such a plan would be disintegration of the political and social institutions, of culture, language, national feelings, religion, and the economic existence of national groups, and the destruction of the personal security, liberty, health, dignity, and even the lives of the individuals belonging to such groups. All modern colonial governments starting with the Spanish conquistadors in America could easily be accused of promoting such “cultural disintegration” or of causing “mental harm,” and hence, perhaps, of genocide. Third, denial of the Ovaherero genocide is widespread in Germany and among descendents of colonial settlers in present-day Namibia. The absence of exact figures on the size of the Ovaherero population before 1904 and on the number killed in 1904 is emphasized by the specialists in genocide denial, despite the fact that the decisive criterion for genocide is intention, not the degree of success. The Germans clearly intended to exterminate their Ovaherero subjects, and this goal was approved at the highest levels of the German metropolitan government in Berlin. A final reason some Germans may be reluctant to acknowledge the character of the events of 1904 may be the desire not to be saddled with official responsibility for yet another case of genocide—especially one that some historians interpret as having laid part of the groundwork for the Nazi Holocaust. In Thomas Pynchon’s novel V, Southwest Africa is described as setting the stage for Nazism, and in Gravity’s Rainbow the Ovaherero resurface in Nazi Germany as the “Schwarzkommando” who worship a rocket program and are dressed in pieces “of old Wehrmacht and SS uniforms.” This is of course entirely fictional, but it does gesture toward the widespread sense of continuity between “Southwest Africa” and Nazism, and toward Ovaherero survivors’ adoption of many of the cultural attributes of their oppressors after 1904. Ovaherero converted in great numbers to Christianity in the concentration camps after resisting missionary blandishments for more than a half century. Many Ovaherero men began to wear odd bits of German military uniforms. These practices emerged out of the post-1904 context of defeat, identification with the aggressor, and German “native polices” that emphasized an abject form of partial assimilation which turned Ovaherero survivors into isolated proletarians. Ovaherero were given German names or simply numbers, their land was seized and sold to German settlers, and their traditional authority structure was banned. Because Ovaherero culture and religion revolved centrally around livestock, they were forbidden from owning cattle. Theoturupa, or “troop players” movement, was initially a degraded version of the enemy’s culture. During the decade after WWI, oturupa organized themselves into districts, with regiments and ranking individuals taking the names and titles of their former German officers. They conducted German-style drills and sent each other notes written in German. The oturupa and the Evangelical church also became sites of mutual aid and anticolonial resistance after 1918 and continued to accumulate new meanings. 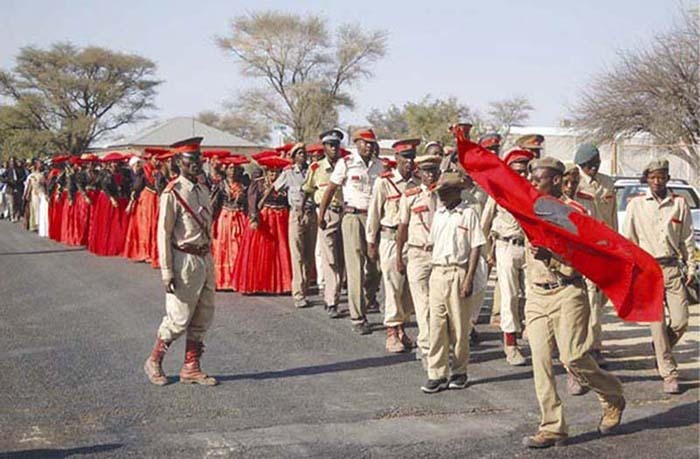 In August 2004, as in years past, Ovaherero led by the oturupa made a pilgrimage to the graves of their leaders in Okahandja (see photo). German policies directed at the Ovaherero between 1904 and 1907 were unambiguously genocidal. On January 12, 1904, anxious Germans opened fire on Ovaherero at Okahandja. This town was not only the center of “Hereroland” with its most powerful headmen but also the site of one of the earliest missionary churches in Central Namibia. It had a sizable number of German settlers and a colonial military station. In the next stage of the war 126 Europeans settlers, almost all adult men, were killed by Ovaherero. Military hostilities then dragged on until June 11, when General Lothar von Trotha arrived in the colony from Germany to take over the direction of the campaign from the colonial Governor, Theodor Leutwein. By early August the majority of the Ovaherero nation was gathered with their cattle at the Waterberg (Hamakari). The decisive battle occurred on August 11, 1904, when 5,000-6,000 poorly armed Ovaherero warriors were encircled by 1,488 German troops and 96 officers armed with modern rifles, machine guns, and cannons. 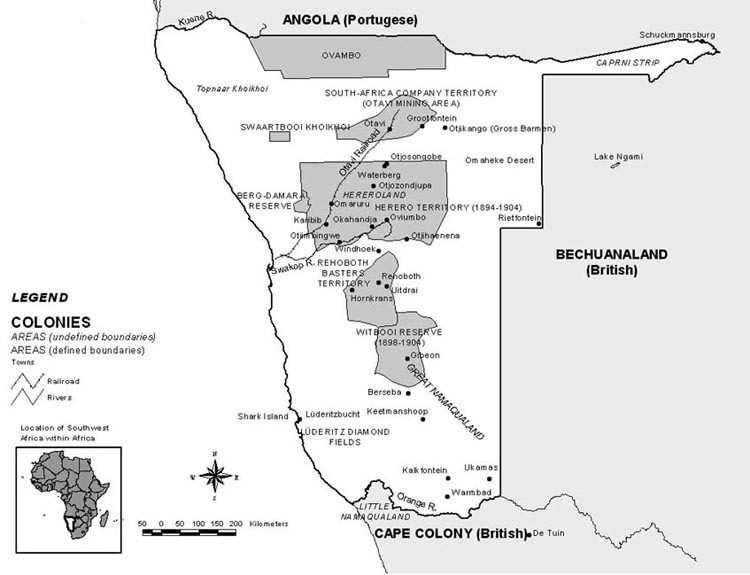 The Ovaherero were defeated and forced to flee, mainly in the direction of the waterless Omaheke desert to the east (see map). The fact that General von Trotha had set up prisoner of war camps at the Waterberg before the battle suggests that at this point in time he was not yet planning to exterminate the Ovaherero. But this goal emerged clearly in the following weeks. On September 13 von Trotha gave orders to drive away any Ovaherero women and children who came to ask for water, and on September 23 he rejected the suggestion by one of his officers, Major Ludwig von Estorff, that the Germans should accept Ovaherero offers to open negotiations. The culmination of this hardening stance was the General’s “words to the Herero people” on October 2, 1904. Nor was responsibility for this course of action limited to the “Great General.” Count von Schlieffen, the head of the Great General Staff of the German Army who had recommended von Trotha for the command, did not immediately countermand the October 2 decision. On November 23 von Schlieffen wrote to the German Chancellor, von Bülow, insisting that “it is hard to disagree with” General von Trotha’s argument that “that the entire [Ovaherero] nation should be annihilated or driven from the country,” since they had “forfeited their lives.” Given the Chancellor’s protests, von Schlieffen did propose as an alternative a “permanent state of forced labor, that is, a form of slavery” for the Ovaherero.” Only on December 9, after tens of thousands had perished in the desert, did von Schlieffen order von Trotha to pardon all Ovaherero except those who were “directly guilty and the leaders.” Countless other Germans supported the genocide by tracking and shooting Ovaherero, poisoning waterholes, and sealing off the eastern edge of the desert. There are numerous photographs and postcards depicting German soldiers and officers standing proudly around the bodies of lynched Ovaherero, recalling the photographs from the antebellum American South. The suffering of the Ovaherero and other anticolonial insurgents did not end with their capture or surrender. As the Acting Governor insisted in 1905, the Ovaherero would have to undergo a “period of suffering” (Leidenszeit) in the concentration camps to guarantee that “they will not revolt again for generations.” At the camp at Shark Island the mortality rate was over 90 percent until a change of command in April 1907. Killing via harsh conditions was practiced in the other camps as well. The earliest suggestion of exploiting captured Ovaherero as forced labor seems to have come from a private diamond mining firm that was part of the German Colonial Society for Southwest Africa (a private chartered company that had been created at Bismarck’s behest in 1885). In August 1904, the firm’s directors asked the government for 50 to 100 workers. The Deutsche Bank and the Woerman shipping company (forerunner of SAFmarine) were major shareholders in the Otavi Mining and Railway Society, which used prisoners to build the railway to its copper mines at Tsumeb. Germany held onto Southwest Africa until 1915. After World War I the League of Nations assigned the colony to South Africa to govern as a “Class A” mandate (this meant that its population was considered too primitive to govern itself). As the last African country to be decolonized (in 1990), independent Namibia is still haunted by colonialism. 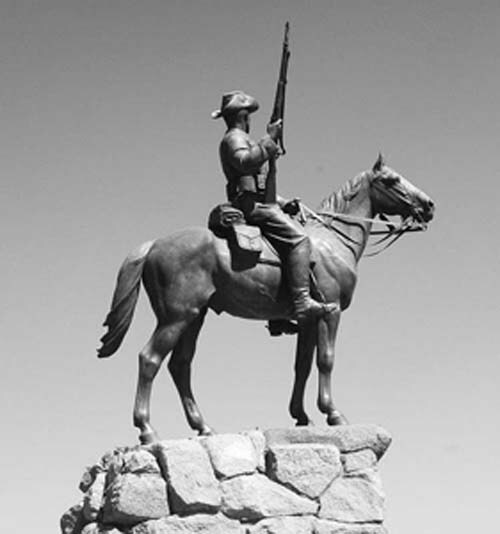 The Equestrian Monument that overlooks the capital city of Windhoek celebrates Germans who killed Namibians (see photo). The nearby “Christ Church” was built in 1910 to commemorate those who died between 1904 and 1908 in the Namibian wars. On its walls are the names of all European casualties but none of the African victims. Some 44 percent of the best agricultural land in Namibia is in the hands of descendents of colonizers who expropriated the land by force. However the German government decides to respond to the continuing demands by Ovaherero and other Namibians for some sort of reparations, Germany cannot escape from its fraught relationship with a country that many Germans cannot even locate on the map and do not realize was once “their” colony. George Steinmetz is professor of sociology and German studies at U-M.